Hill after hill, winery after winery, I stuck it out and tried all of the wines the course had to offer. For those aspiring marathoners who are passionate about wine, this is a great, challenging run. The downhill portions of the route were as refreshing as the wines being poured. After a 1.5 km climb at the beginning of the race, we happened upon Thirty Bench Winery pouring an Unoaked Chardonnay, followed by East Dell Winery serving both their Unoaked Chardonnay and Summertime Rose. The Rose was particularly thirst quenching with strawberry and raspberry on the nose and a burst of acidity on the finish; for $9.95, great summertime sipper. As we clamoured on, the views of all the vineyards were breathtaking; I frequently motor along in my car and forget how beautiful the Niagara wine route truly is. Mountain Road Wine Company was an extraordinary site at 1/3 of the way through, tasting three wines with an award of excellence going to them for pouring their Vidal Icewine; I have tried this wine before, but for some reason the apricots just exploded out of the glass, and the syrupy sweetness on the palate was that much more elevated. For $40 a bottle this Icewine is great. At the 12 K Marker, Malivoire had runners climb a hill to their tasting room to sip their treats. Well worth the grind, we had the opportunity to try their featured Chardonnay Musque and Ladybug Rose in real glass tasting glasses to boot. Climbing our supposed “Last” hill, Tawse was at the 13k point boasting a crisp and refreshing rose and a Chardonnay; have to say, at this point, my palate was thriving for anything sweet and refreshing and the Tawse Rose answered its call; I even asked for a second sip. 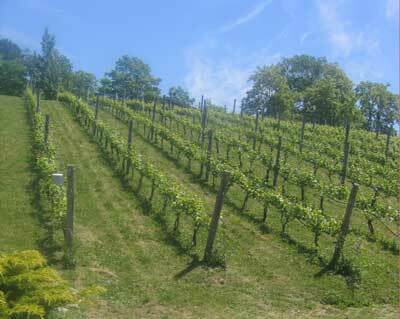 Vineland Estates Winery was pouring a crisp Riesling and, a view to kill; they really have a beautiful vineyard. Drummers were also drumming to ensure we kept pace to our next stop at Featherstone. Pouring their Off Dry Riesling “Four Feathers”, a white wine blend of primarily Riesling with a careful blend of other estate grown aromatic whites (I’m guessing Pinot Gris, Gewurztraminer and Sauvignon Blanc); this was clearly my favourite for the day. At this point in the run, I have to say, I was looking forward to the finish line and the “Down hill” portion of the run. After two more climbs, one of which was self induced in order to have a taste of Sauvignon Blanc at Calymus, we were in the home stretch into Jordan Village that was all downhill. Slightly anticlimactic at the finish line, because there were virtually no spectators, but the post race party was fabulous. I have completed several runs and this was, not doubt, the best post race party. Our post race meal was Pork on a bun and Tawse’s Cabernet Merlot; for $7.00, I was very happy. 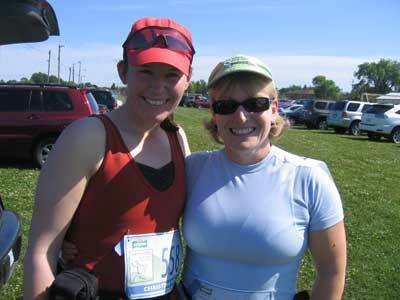 Would I do the race again? Don’t know…Love the wine, but not a fan of point to point races. Bloggers, doesn’t this make you want to take up running?! If you enjoyed this run vicariously, you will want to wait anxiously for Christine’s report from our upcoming marathon through Medoc. 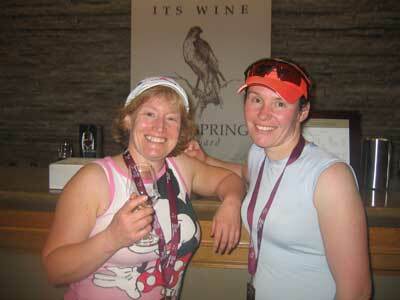 September 12 09 - 42.2 km of running, 60 chateaux, 21 wine stations and gourmet food stands. Christine will be bring you every detail of all the fun along the way.